The prognostic value of clinic and ambulatory BP in predicting incident CKD and whether CKD risk reduction associates with progressive treatment–induced decrease of clinic, awake, or asleep BP are unknown. We prospectively evaluated 2763 individuals without CKD, 1343 men and 1420 women (mean±SD age: 51.5±14.3 years old), with baseline ambulatory BP ranging from normotension to hypertension. On recruitment and annually thereafter (more frequently if hypertension treatment was adjusted on the basis of ambulatory BP), we simultaneously monitored BP and physical activity (wrist actigraphy) for 48 hours to accurately derive individualized mean awake and asleep BP. During a median 5.9-year follow-up, 404 participants developed CKD. Mean asleep systolic BP was the most significant predictor of CKD in a Cox proportional hazard model adjusted for age, diabetes, serum creatinine concentration, urinary albumin concentration, previous cardiovascular event, and hypertension treatment time (on awakening versus at bedtime; per 1-SD elevation: hazard ratio, 1.44; 95% confidence interval, 1.31 to 1.56; P<0.001). The predictive values of mean clinic BP and mean awake or 48-hour ambulatory BP was not significant when corrected by mean asleep BP. Analyses of BP changes during follow-up revealed 27% reduction in the risk of CKD per 1-SD decrease in mean asleep systolic BP, independent of changes in mean clinic BP or awake ambulatory BP. In conclusion, sleep-time BP is a highly significant independent prognostic marker for CKD. Furthermore, progressive treatment–induced decrease of asleep BP, a potential therapeutic target requiring ambulatory BP evaluation, might be a significant method for reducing CKD risk. These findings support evaluation of two hypotheses that have never before been jointly investigated: (1) features of the 24-hour ABP pattern are predictive of new-onset CKD risk and development; and (2) targeting potential prognostic ABPM-derived risk markers by therapeutic intervention modifies the risk of CKD. The Monitorización Ambulatoria para Predicción de Eventos Cardiovasculares (MAPEC) Study (i.e., Ambulatory BP Monitoring for Prediction of Cardiovascular Events) was specifically designed to prospectively investigate whether specific treatment-induced changes in the 24-hour ABP profile reduce risk of CVD, diabetes, and renal events6,26,27: in particular, whether reduced risk of developing CKD might be more strongly related to the progressive decrease of clinic BP or the ABP-derived awake, asleep, or 24-hour BP means. During the median follow-up period of 5.9 years (range =1.0–8.9 years), 404 participants developed CKD (event rates of 5.64, 19.13, and 24.78 per 1000 patients per year for development of albuminuria, reduced eGFR, and total CKD, respectively) (Supplemental Figure 1). Event subjects were those who, at baseline, were likely to have type 2 diabetes, metabolic syndrome, abdominal obesity, and/or history of previous CVD event (Table 1). In addition, at baseline, they had greater clinic BP and higher glucose, uric acid, triglycerides, plasma fibrinogen, and urinary albumin levels but lower eGFR (Table 1). At baseline, the 48-hour mean of SBP but not the 48-hour mean of DBP was significantly greater among event subjects (Table 1). The largest difference between the event and nonevent groups was in the asleep SBP mean. Moreover, the sleep-time relative SBP decline was significantly lower (P<0.001) and prevalence of nondipping was significantly higher (69% versus 42%) among event subjects (P<0.001) (Table 1). All differences between groups reported in Table 1 with a P<0.002 stand as significant after correcting for multiple testing. Table 2, column 2 reports the hazard ratios (HRs) of new-onset CKD estimated by the Cox proportional hazard model calculated on the basis of the baseline clinic and ABP evaluations of each participant. Increased risk of CKD was jointly associated with older age (HR, 1.04; 95% confidence interval [95% CI], 1.03 to 1.05; P<0.001 per year), elevated serum creatinine (HR, 1.23; 95% CI, 1.19 to 1.27; P<0.001 per milligrams per liter), elevated urinary albumin excretion (HR, 1.28; 95% CI, 1.22 to 1.34; P<0.001 per 10× log [milligrams per 24-hour urine]), presence of type 2 diabetes (HR, 1.50; 95% CI, 1.16 to 1.93; P=0.002 compared with absence of diabetes), and history of previous CVD event (HR, 1.83; 95% CI, 1.22 to 2.75; P=0.003 compared with absence of such history). Additionally, patients who are hypertensive ingesting all prescribed BP-lowering medications on awakening showed a significantly higher HR of CKD than those ingesting the complete daily dose of one or more such medications at bedtime (HR, 1.73; 95% CI, 1.51 to 1.98; P<0.001). Table 2, column 2 shows that the HR of CKD on the basis of the baseline clinic and ABP measurements was greater with progressively higher asleep SBP mean and lower sleep-time relative SBP decline (i.e., more nondipper BP pattern). The asleep SBP mean was indeed the most significant BP predictor of CKD (per 1-SD elevation; HR, 1.44; 95% CI, 1.31 to 1.56; P<0.001) (Table 2, column 2). The adjusted Cox regression model including the asleep SBP mean had the lowest Akaike Information Criteria (AIC)28 among all other parameters tested in Table 2. 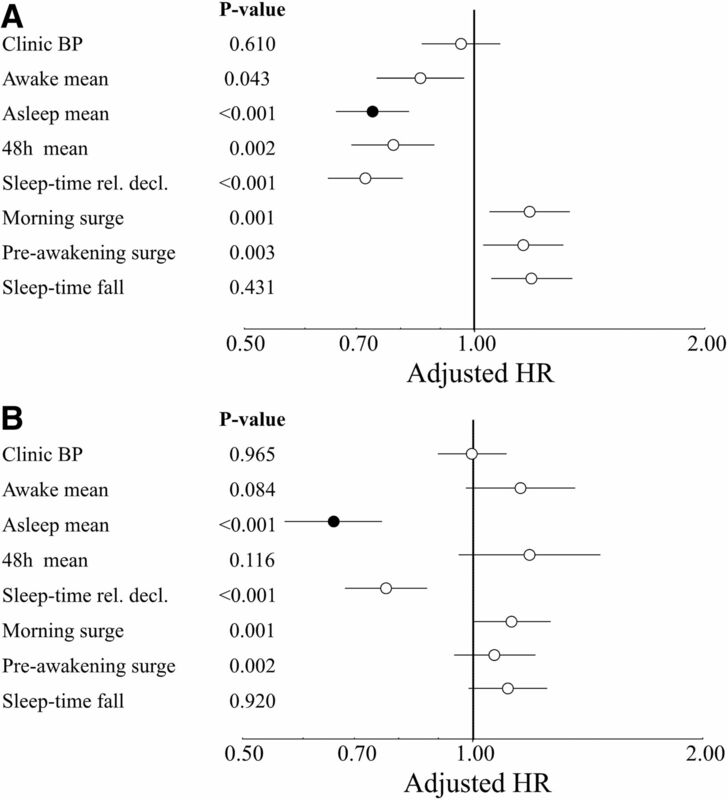 Difference in AIC with respect to the asleep SBP mean was always ≥11, indicating a considerably worst prognostic value for all other BP variables. A stepwise Cox regression analysis further indicated that, just after serum creatinine, the asleep SBP mean was the second most significant prognostic marker of CKD. Interestingly, a greater either morning or preawakening BP surge calculated as previously defined29 was significantly associated with lower, not higher, risk of CKD (Figure 1A, Table 2, column 2). This finding is in agreement with the highly significant association between greater sleep-time relative BP decline and attenuated risk. The prognostic value of the asleep SBP mean for predicting new-onset CKD was highly significant: (1) independent of absence/presence of hypertension treatment and time of day of treatment (i.e., for participants randomized to the awakening versus bedtime treatment groups analyzed separately) and (2) regardless of baseline ABP level (i.e., for the normotensive and hypertensive cohorts of participants analyzed separately; always P<0.001). Among subjects who were normotensive, event subjects compared with nonevent ones had significantly greater asleep (107.3±7.8 versus 102.6±8.6 mmHg; P<0.001) but not significantly greater awake SBP mean (116.6±9.8 versus 116.7±8.6 mmHg; P=0.97) and higher prevalence of nondipping (63% versus 37%; P<0.001). Adjusted HR (95% CI) of CKD per 1-SD elevation in baseline clinic and ambulatory SBP. (A) Each tested parameter evaluated separately. (B) Results adjusted by asleep SBP mean. Adjustments were applied for significant influential characteristics of age, serum creatinine, urinary albumin, diabetes, previous CVD event, and hypertension treatment time. Table 2, column 3 reports the HR of CKD on the basis of the clinic and ABP measurements obtained for each participant at his/her final evaluation. The findings are similar to those described above on the basis of the corresponding data of the baseline evaluation (Table 2, column 2), thereby providing evidence of the ability to estimate of the results during follow-up, namely the greater prognostic value of the asleep BP mean and sleep-time relative BP decline compared with any of the other ABP characteristics. We next evaluated the potential combined contribution to the risk of CKD of the multiple BP parameters listed in Table 2. When the baseline asleep SBP mean was jointly evaluated with either clinic SBP, awake or 48-hour SBP means, or morning SBP surge, only the former significantly predicted CKD (Figure 1B). According to the findings, when corrected by the asleep BP mean value, a lower, not higher, awake or 48-hour BP mean was significantly associated with increased risk, providing further evidence of the additional prognostic value for CKD of the sleep-time relative SBP decline in a fully adjusted joint Cox regression model that already includes the asleep SBP mean (Figure 1B). To further investigate the clinical relevance of the awake and asleep BP means on CKD risk, participants were categorized into four groups according to ABP level (i.e., normal or elevated awake and normal or elevated asleep BP mean) independent of clinic BP using established ABPM thresholds of 135/85 mmHg for the awake SBP/DBP means and 120/70 mmHg for the asleep SBP/DBP means.24,25 Figure 2A, which shows the results of this analysis, indicates (1) lower adjusted HR for CKD of participants with normal asleep BP when the awake BP mean is elevated rather than normal (P=0.01); (2) equivalent HR in patients who are hypertensive with elevated asleep BP, regardless of whether the awake BP mean is normal or elevated (P=0.33); and (3) significantly higher adjusted HR of CKD in participants with elevated rather than normal asleep BP mean, independent of the awake BP mean being below or above 135/85 mmHg (always P<0.001). Relationship between CKD risk and level (normal or elevated) of clinic BP and ABPM-derived awake and asleep BP means. (A) Adjusted HR of CKD as a function of awake and asleep SBP/DBP means; light gray bars denote normal awake BP mean, and dark gray bars denote elevated awake BP mean. (B) Adjusted HR (95% CI) of CKD as a function of clinic BP and awake plus asleep SBP/DBP means; light gray bars denote normal clinic BP mean, and dark gray bars denote elevated clinic BP mean. Awake SBP/DBP mean was considered normal if <135/85 mmHg and elevated otherwise. Asleep SBP/DBP mean was considered normal if <120/70 mmHg and elevated otherwise. Clinic SBP/DBP was considered normal if <140/90 mmHg and elevated otherwise. Adjustments were applied for the same variables as in Figure 1. Exploration of the combined contribution to the risk of CKD of multiple BP parameters further revealed lack of predictive value of clinic SBP when corrected by the asleep SBP mean (HR, 1.05; 95% CI, 0.94 to 1.18; P=0.39) (Figure 1B). Indeed, when each of the four groups of participants categorized by awake and asleep BP means in Figure 2A was further categorized according to either normal or elevated clinic BP (using the currently accepted 140/90-mmHg thresholds), CKD risk was significantly higher in all of the four groups of patients classified by elevated asleep ABP mean, regardless of whether clinic BP or awake ABP mean was normal or elevated, than in all of the other four groups of individuals classified by normal sleep-time ABP mean (Figure 2B). 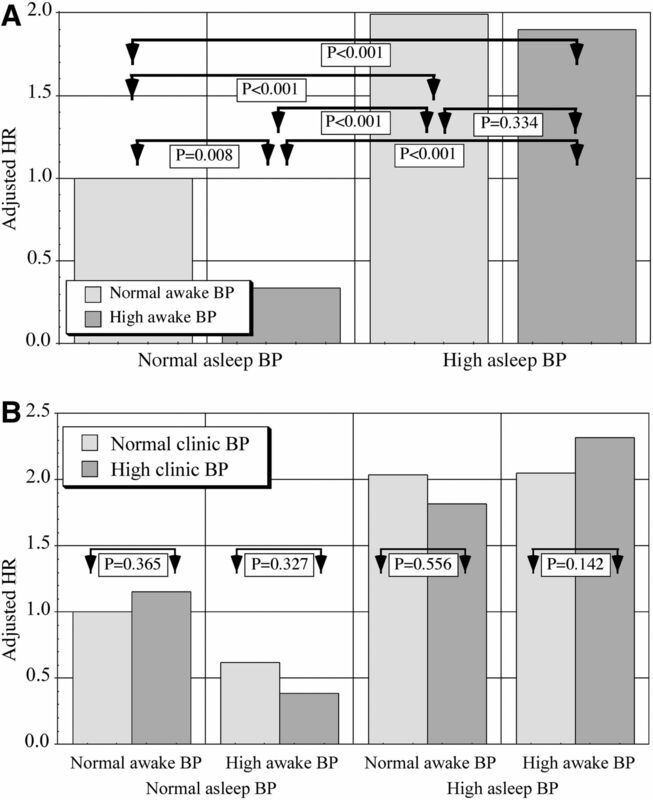 Additionally, there were no significant differences in HRs for CKD of participants with either normal or elevated clinic BP within each of the four groups defined by awake and asleep BP means (always P>0.14) (Figure 2B). Table 2, column 4 presents the results of the time-dependent Cox regression analysis (adjusted by the significant confounders of age, serum creatinine, urinary albumin, diabetes, history of previous CVD event, baseline BP, and hypertension treatment time) of changes in BP during follow-up (i.e., difference for any tested BP parameter between the values obtained on recruitment and at the final evaluation per participant). The progressive decrease in asleep SBP mean and the increase in sleep-time relative SBP decline toward a more dipper BP patterning were associated with significantly increased event-free survival (i.e., absence of CKD) (Figure 3A). When changes in clinic- and ABPM-derived SBP parameters were adjusted by changes in asleep SBP mean during follow-up, only the decrease in asleep SBP mean and increase in sleep-time SBP decline remained significantly associated with reduced CKD risk (Figure 3B). Adjusted HR (95% CI) of CKD per 1-SD change during follow-up in clinic and ambulatory SBP from baseline. (A) Each tested parameter evaluated separately. (B) Results adjusted by asleep SBP mean. Adjustments were applied for significant influential characteristics of age, serum creatinine, urinary albumin, diabetes, previous CVD event, baseline BP, and hypertension treatment time. Figure 4 shows, for the studied population divided into quintiles, the relationship between CKD risk and achieved clinic BP and ABP at final evaluation. For the clinic and awake SBP mean, the adjusted HR was only slightly higher in the last quintile compared with the first three quintiles. In contrast, there was a highly significant decrease in CKD risk with progressively lower achieved asleep SBP mean throughout all of the quintiles (Figure 4C). Along these lines, the adjusted HR for CKD was increased significantly when the achieved sleep-time SBP decline was <12% (Figure 4D). Relationship between CKD risk and achieved clinic and ambulatory BP at final evaluation. Adjusted HR of CKD as a function of (A) achieved clinic SBP and ABPM-derived (B) awake SBP mean, (C) asleep SBP mean, and (D) sleep-time relative SBP decline. The studied population was divided into five classes of equal size (quintiles). Adjustments were applied for the same variables as in Figure 1. The MAPEC Study is the first outcomes investigation to assess prospectively (in a relatively large cohort of persons with normotension to hypertension at baseline on the basis of ABP criteria) the prognostic value for incident CKD of not just clinic BP and ABP parameters on recruitment but also, their changes during a follow-up of sufficient duration by systematic periodic (at least annual) evaluation using highly reproducible 48-hour ABPM along with wrist actigraphy, which enables precise individual determination of the awake and asleep spans and thus, precise derivation of awake and asleep BP means plus sleep-time relative BP decline. Analyses on the basis of the 48-hour ABP profile obtained per participant at both baseline, as customary in all previous studies of ABPM for predicting CVD events, and final evaluation indicate that the asleep SBP mean is the most significant predictor of CKD among the different evaluated ABP parameters plus and clinic BP (Table 2), both individually and jointly, when combined with other potential ABP-derived prognostic markers in the best possible Cox proportional hazard model (Figure 1). In fact, only the diminished sleep-time relative SBP decline added significant prognostic value to the model that already included the asleep SBP mean and corrected for relevant confounding variables. Moreover, when the asleep SBP mean was adjusted for the clinic SBP or the awake SBP mean, only the former was a significant and independent predictor of outcome (Figure 2). Most important from the perspective of disease prevention, evaluation of changes in the ABP parameters during follow-up indicates that the progressive decrease in the asleep SBP mean and that the increase in sleep-time relative SBP decline toward the more normal dipper BP pattern are significantly associated with reduced CKD risk. The relationship between decreasing asleep SBP mean and attenuated risk for CKD during follow-up is significant at all levels of the baseline asleep SBP mean ranging from normotension to hypertension, suggesting potential benefit even below the asleep SBP/DBP means of 120/70 mmHg, the current diagnostic thresholds for sleep-time hypertension.24,25 Indeed, analysis of the adjusted HR for CKD in terms of the achieved asleep SBP mean at the last available evaluation per participant reveals significant risk reduction, even when the sleep-time SBP mean is <100 mmHg (Figure 4C). Moreover, the risk for incident CKD was also significantly lower when the achieved sleep-time SBP decline at the final evaluation was >12% (Figure 4D). This finding suggests that the sleep-time relative SBP decline, as a continuous variable and not just as the dipping classification per se usually on the basis of an arbitrary 10% threshold value, might be preferably used to assess and prevent risk for future CKD. Collectively, these novel results indicate not only that the asleep SBP mean is the most significant and independent prognostic marker of CKD risk but also, that decreasing the asleep SBP mean might be significantly protective, independent of the other conventionally considered variables here documented to be linked with increased risk of CKD, such as elevated serum creatinine and urinary albumin, older age, diabetes, and previous CVD event. Several studies have found sleep-time hypertension and the nondipper/rising BP pattern to be predictors of the development and progression of albuminuria,30,31 worsening proteinuria,32 decline in eGFR,20,21 and progression to ESRD.11,33–35 In a retrospective study of 102 Korean patients who were nondiabetic and hypertensive followed for an average of 4.2 years, An et al.36 found that the nondipper BP pattern was a significant predictor of incident CKD; however, in this rather small study, only 11 participants developed CKD defined solely on the basis of reduced eGFR without accounting for albuminuria. Kanno et al.,37 who evaluated 843 Japanese individuals by 24-hour ABPM only once on recruitment, concluded after a median follow-up of 8.3 years that nighttime BP was significantly associated with risk of CKD (defined as reduced eGFR or proteinuria) and a composite outcome of CKD and all-cause mortality, whereas the 24-hour and daytime ABP means as well as conventional clinic BP measurements were not; the sleep-time relative BP decline and the standard arbitrary nondipping classification did not significantly differ in relation to CKD risk. More recently, McMullan et al.38 conducted a prospective cohort study of 603 blacks without CKD defined on the basis of eGFR alone who underwent a unique 24-hour ABPM evaluation at baseline. After a median of 8.1 years of follow-up, the sleep-time relative SBP decline was the most significant predictor of incident CKD defined on the basis of a single and thus, unconfirmed reduced eGFR determined at the last of just two clinical assessments per participant performed during follow-up; moreover, a greater asleep but not awake BP mean was significantly associated with increased risk of CKD after adjusting for potential confounders.38 Apart from several limitations, including relatively small sample sizes and differing and potentially misleading definitions of CKD, all of these previous studies on the prognostic value of ABPM for predicting incident CKD have in common reliance on a single, low-reproducible,39 baseline 24-hour ABPM evaluation per participant at the time of inclusion without accounting for expected changes in the level and pattern of ABP during the years of follow-up, mainly associated with hypertension therapy, aging, and developing target organ damage and/or concomitant diseases.1,6 Thus, the potential reduction in CKD risk associated with modifying prognostic ABPM parameters (i.e., specifically reducing asleep BP and increasing sleep-time relative BP decline toward the normal dipper pattern) has never before been prospectively evaluated. Our study has some potential limitations. First, compared with other larger multicenter studies of patients who are hypertensive with clinic BP only, the sample size of the MAPEC Study might seem small. Nonetheless, it is considerably greater than all other published investigations on the prognostic value of ABPM for predicting CKD risk.36–38 Second, the reported findings, showing a highly significant relationship between risk for CKD and elevated sleep-time BP plus attenuated sleep-time relative BP decline, require validation and extrapolation to other ethnic groups. Our study also has several strengths, mainly being the first to provide results that are on the basis of systematic periodic multiple evaluations by ABPM throughout the median of 5.9 years of follow-up. This so-far unique approach allowed determination of the effect of specific changes in the characteristics of the ABP profile that occurred during follow-up on the risk of developing CKD. Further strengths of our study are use of (1) 48-hour instead of the most common 24-hour ABPM sampling to increase reproducibility of the BP findings39 and (2) wrist actigraphy to precisely and individually determine the beginning and end of the activity and sleep spans of each participant to enable accurate calculation of the awake and asleep ABP means. In conclusion, according to this investigation, the sleep-time SBP mean but not the daytime clinic BP values or the awake ABP mean is the most significant and independent prognostic marker of CKD. Alteration of sleep-time BP regulation, highly frequent in CKD,20–23 seems to precede and predict rather than follow development of CKD. On the basis of the substantial evidence documenting that ABP predicts long-term CVD outcomes independent of clinic BP,5–11,13–16 the recent 2015 US Preventive Services Task Force report40 concluded that ABPM is required for diagnosing adult hypertension. Our findings further support ABPM to accurately detect abnormal sleep-time BP and beyond its documented merit for assessing CVD risk,5–11,13–16 evaluate risk of progression to CKD. Furthermore, therapeutic targeting of abnormalities of the asleep SBP mean and sleep-time relative SBP decline, most effectively achieved by bedtime ingestion of the full daily dose of one or more conventional hypertension medications,41,42 might be associated with significantly lower risk for developing CKD. Complete details of the rationale and design of the MAPEC Study are described in previous publications.6,7,10,26,27 In summary, the sample consisted of Spanish individuals ≥18 years of age who adhered to a routine of daytime activity and nighttime sleep. Inclusion criteria required participants to be normotensive, untreated hypertensive, or resistant to treatment when ingesting all of their prescribed BP-lowering medications on awakening. For this study, we established a priori a minimum 1-year follow-up per participant. Exclusion criteria were pregnancy, history of drug/alcohol abuse, night/shiftwork employment, AIDS, type 1 diabetes, secondary hypertension, CVD disorders (unstable angina pectoris, heart failure, life-threatening arrhythmia, and grades 3 and 4 retinopathy), nephropathy, intolerance to ABPM, and inability to communicate and comply with all study requirements. Previous CVD events were not exclusionary if full physical and working activities were maintained. Participants represent a consecutive series of persons fulfilling these exclusion/inclusion criteria recruited among those referred to the hospital for ABPM evaluation, mainly to confirm/reject the diagnosis of hypertension inferred by daytime clinic cuff BP measurement of untreated individuals or evaluate BP control in treated patients. Additional reasons to request ABPM included, among several others, impaired fasting glucose, metabolic syndrome, diabetes, CKD, previous complications in pregnancy, suspicion of sleep disorders, and age ≥60 years old. This prospective single-center study was approved by the state Ethics Committee of Clinical Research. All participants gave written informed consent. CKD was defined as eGFR<60 ml/min per 1.73 m2, albuminuria (urinary albumin excretion ≥30 mg/24-h urine or albumin-to-creatinine ratio ≥30 mg/gCr), or both on at least two occasions ≥3 months apart.43 eGFR (milliliters per minute per 1.73 m2) was estimated by the Chronic Kidney Disease Epidemiology Collaboration equation.44 Diabetes was defined as fasting glucose ≥126 mg/dl on at least two clinical assessments ≥3 months apart in participants without prior history of diabetes or glucose-lowering treatment.45 Diagnosis of metabolic syndrome was established by the National Cholesterol Education Program Adult Treatment Panel III revised definition.46 Obesity was defined as body mass index ≥30 kg/m2. Anemia was defined as hemoglobin <13 g/dl in men and <12 g/dl in women. Diagnosis of obstructive sleep apnea (apnea/hypopnea index ≥10) was corroborated by overnight in-hospital polysomnography when the participant or bedmate reported excessive daytime sleepiness and loud snoring, choking, interrupted breathing, and/or awakenings during nighttime sleep. At inclusion and every scheduled visit to the clinic for ABPM during follow-up, SBP and DBP of each participant were automatically measured every 20 minutes between 0700 and 2300 hours and every 30 minutes during the night for 48 consecutive hours with a calibrated SpaceLabs 90207 ABPM Monitor (SpaceLabs Inc., Issaquah, WA). A 48-hour instead of the most common 24-hour monitoring span was chosen to improve reproducibility of results, because accurate calculation of ABP characteristics (including mean BP values) and dipping classification depends markedly on duration of ABPM.39 Participants were instructed to adhere to their usual activities with minimal restrictions but maintain a similar activity-rest schedule and avoid daytime napping during the 2 consecutive days of monitoring. In keeping with current recommendations,25 BP series was considered invalid for analysis, and thus, ABPM was repeated within the same week if ≥30% of the measurements were missing, data were lacking for an interval of >2 hours, data were obtained when the rest-activity schedule was irregular or inconsistent during the 2 days of monitoring, or the nighttime sleep span was <6 or >12 hours. Blood withdrawal from an antecubital vein was done in the clinic between 0800 and 0900 hours after overnight fasting the same week when each 48-hour ABPM session was initiated. Participants collected all of their urine voids during the first 24 hours of ABPM. Blood and urine samples were analyzed using routine automatic techniques in the hospital laboratory. Just before commencing each 48-hour ABPM session, the same investigator obtained six consecutive clinic BP measurements using a validated automatic oscillometric device (HEM-705IT; Omron Health Care Inc., Vernon Hills, IL) after the participant had rested in a seated position for ≥10 minutes. Proper cuff size for clinic and ABP assessment was determined by measurement of upper arm circumference at each study visit. Participants underwent the same evaluation procedures described above, including conventional daytime clinic BP measurement, 48-hour ABPM/wrist activity monitoring, and blood/urine analysis, plus other complementary tests as ordered by physicians (e.g., electrocardiogram, funduscopic examination, echocardiogram, etc.) annually or more frequently (3 months after any doctor-ordered change in therapy to improve ABP control in treated patients). Blood/urine analyses were also performed at intermediate clinic visits as scheduled by the participating physicians in keeping with current medical practice; in particular, such analyses were repeated within 3 months if showing elevated fasting glucose or albuminuria/reduced eGFR to allow proper diagnosis of incident diabetes or CKD, respectively, as defined above. Investigators blinded to the treatment scheme of patients who are hypertensive and not involved in clinic evaluations, ABP measurement, and statistical analyses assessed the development of CKD, as defined above, among other MAPEC Study outcome variables of interest. Complete clinical records of all enrolled participants were reviewed at least annually plus the year after their last ABPM. ABPM profiles were edited according to conventional criteria to correct for measurement errors and outliers; SBP readings >250 or <70 mmHg, DBP>150 or <40 mmHg, and pulse pressure (SBP minus DBP) >150 or <20 mmHg were automatically discarded. The 48-hour ABP mean was calculated as the average of all valid readings obtained throughout the 48-hour assessment span. Awake and asleep ABP means were calculated from the 48-hour monitoring as the average of all valid readings obtained during the hours of daytime activity or nighttime sleep, respectively, as differentiated by wrist actigraphy. Sleep-time relative BP decline (index of BP dipping), defined as percentage decrease in mean BP during nighttime sleep relative to mean BP during daytime activity, was calculated as [(awake ABP mean − asleep ABP mean)/awake ABP mean]×100, incorporating all of the data sampled by 48-hour ABPM. For comparative purposes, a subject was defined as dipper if the sleep-time relative SBP decline was ≥10% and nondipper otherwise. The risk of CKD was evaluated on the basis of (1) the baseline and final clinic and ABPM evaluation from every participant and (2) the changes in any tested clinic cuff and ABP parameter per participant during follow-up. Demographic and clinical characteristics were compared among groups of individuals who did or did not develop CKD by t test (quantitative variables) or nonparametric chi-squared test (proportions). The Cox proportional hazard model, adjusted for significant confounding variables, was used to estimate HR with 95% CI for events associated with each tested potential prognostic BP parameter; we standardized these HRs by calculating them per 1-SD increments for each BP parameter. All demographic, anthropometric, and clinical laboratory variables listed in Table 1 showing a significant difference between event and nonevent participants were tested as potential confounding variables by stepwise Cox survival analysis. Adjustments were finally applied for the jointly significant influential characteristics of age, serum creatinine, urinary albumin, type 2 diabetes, history of previous CVD event, and hypertension treatment time, because these factors were the only ones jointly significant in the tested Cox regression models. However, the prognostic value of clinic and ABP changes during follow-up was evaluated by entering the change of the BP parameter of interest as a time-dependent covariate in the Cox regression model, thus allowing proper confirmation of the underlying hypotheses for the analysis. For survival analysis, follow-up was established as either the interval of time to the confirmed diagnosis of CKD or the interval of time to the last clinical evaluation in nonevent participants. We additionally compared the prognostic value of the different tested ABPM parameters plus clinic BP by the AIC.28 Model selection was performed by evaluating differences in AIC between tested ABPM parameters according to the rules proposed by Burnham and Anderson.48 Thus, if the difference in AIC between two survival models is between zero and two, the models are approximately equivalent; if the difference is between four and seven, the model with higher AIC is considerably worse, and if the difference is more than ten, the model with higher AIC is much worse. This independent investigator-promoted research was supported by Ministerio de Ciencia e Innovación, Spanish Government unrestricted grants SAF2006-6254-FEDER and SAF2009-7028-FEDER; Instituto de Salud Carlos III, Ministerio de Economía y Competitividad, Spanish Government unrestricted grant PI14-00205; Xunta de Galicia unrestricted grants PGIDIT03-PXIB-32201PR, INCITE07-PXI-322003ES, INCITE08-E1R-322063ES, INCITE09-E2R-322099ES, 09CSA018322PR, and IN845B-2010/114; European Research Development Fund and Consellería de Cultura, Educación e Ordenación Universitaria, Xunta de Galicia unrestricted grants CN2012/251, CN2012/260, and GPC2014/078; and unrestricted grants from Vicerrectorado de Investigación, University of Vigo. This article contains supplemental material online at http://jasn.asnjournals.org/lookup/suppl/doi:10.1681/ASN.2016111186/-/DCSupplemental.